Can I admit I'm kind of sad that this in my last Aladdin post? 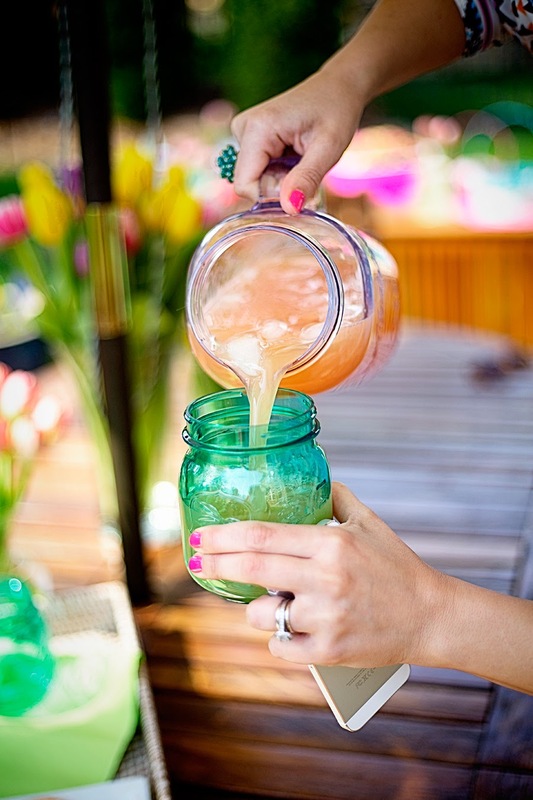 I've seriously loved sharing the gorgeous photos of my Spring brunch featuring Aladdin Mason Collection mason jars. 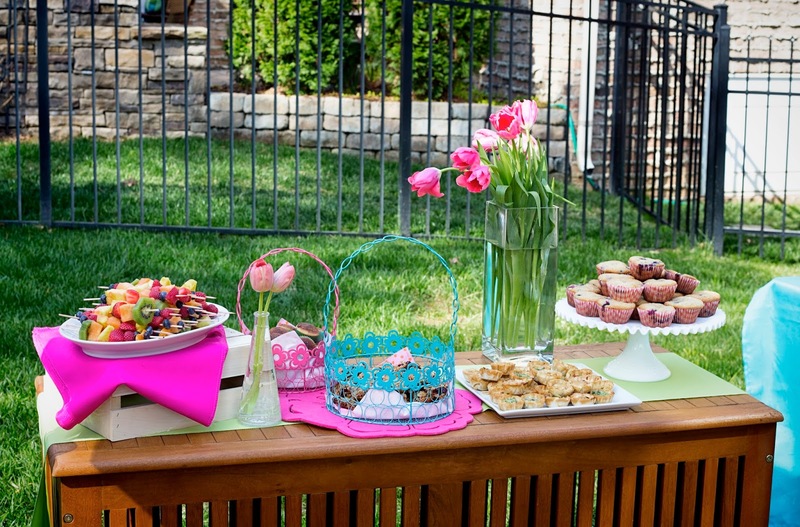 I've already shown you my tips for decorating a simple spring brunch HERE and now as promised I want to share the cocktail and drink menu for this no-hassle brunch. Here was the food set-up. 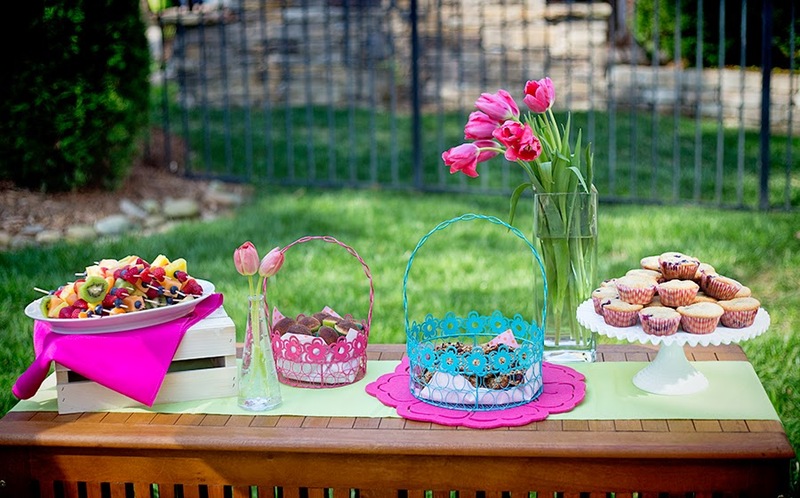 I used a lime green runner and colorful baskets, crates and cake stands to add color and different heights to the display. And of course, fabulous tulips. I love how they naturally drooped to the side. On the menu? I picked easy to pick up food that was light and of course, pretty to look at. 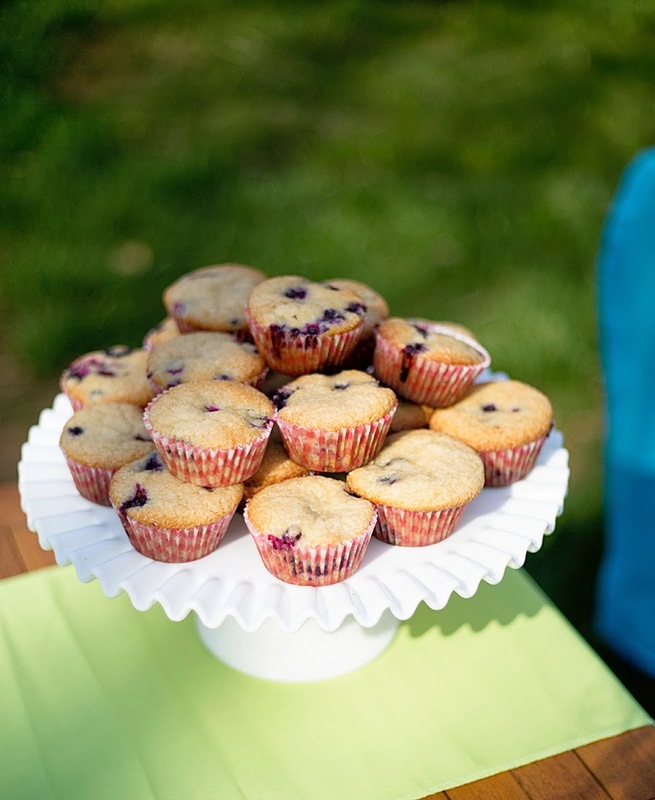 We had muffins, mini quiche, granola squares and fruit skewers. It was the perfect assortment and really stress-free because almost all of the items could be made the day before. The fruit skewers are beautiful but in the effort of full disclosure (because that's how I roll) a real pain in the arse to make. And also dangerous - those things are sharp. If you ever need a weapon you can just stab someone with one of these skewers, they WILL draw blood, I promise. 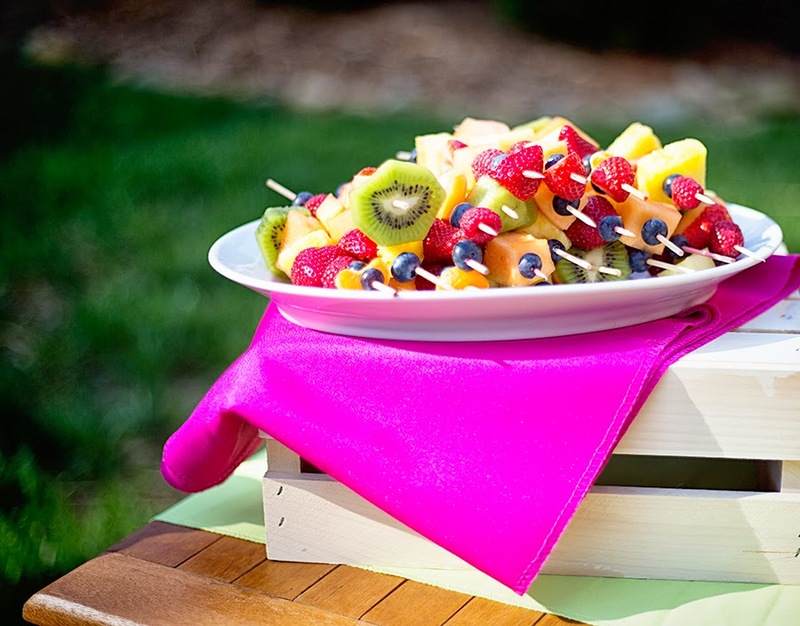 All this said the beautiful photo below makes the effort all worth it, the skewers really are prettier than a bowl full of fruit. Now on to my next favorite topic, cocktails. Mimosas is an obvious choice for a brunch cocktail, but I decided to mix it up by making it a grapefruit mimosa. People have mixed feelings about grapefruit but I promise the tartness of the grapefruit mixes really well with the sweetness of the champagne. It's incredibly refreshing. 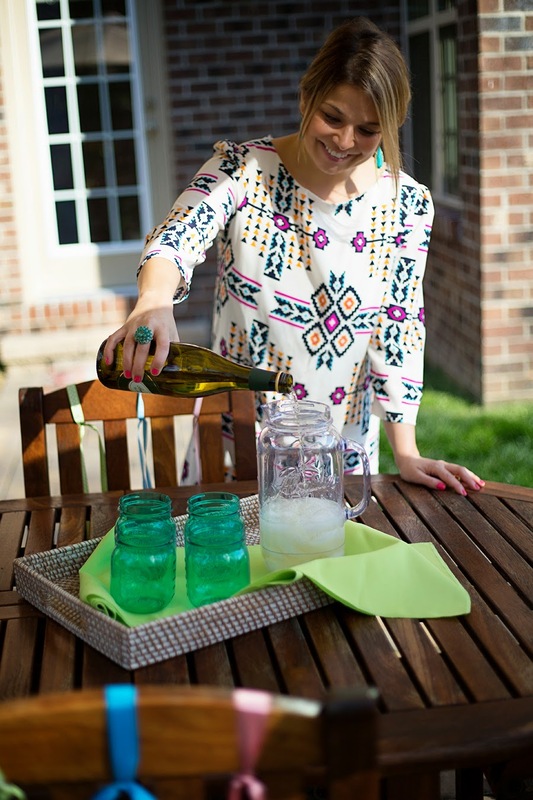 The Aladdin Mason pitcher might be my favorite product of the whole line and I love the blue/green color of the tumblers too. Perfection. 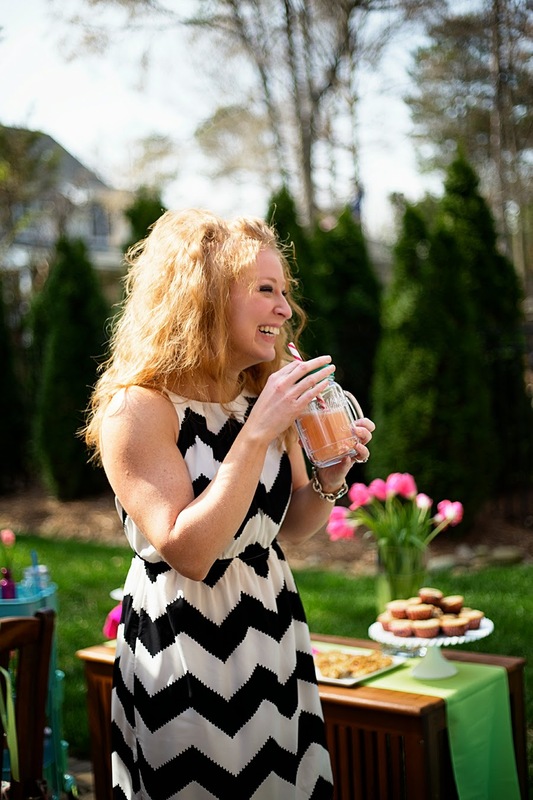 I love the below picture where I am pouring the mimosa into a tumbler. My favorite part is that I have my phone in the photo, which is pretty standard for me - it's like my third arm. I think I have a problem. In this case I had my phone ready so I could hashtag #aladdinparty whenever the moment felt right. To show off the equally fabulous one-gallon Aladdin Mason dispensers, I set up a spa water station which looked awesome (in my humble opinion). The best part about spa water is a) you feel like you are at a spa and b) the fruit infuses the water so quickly, you really feel like you are drinking "strawberry water." 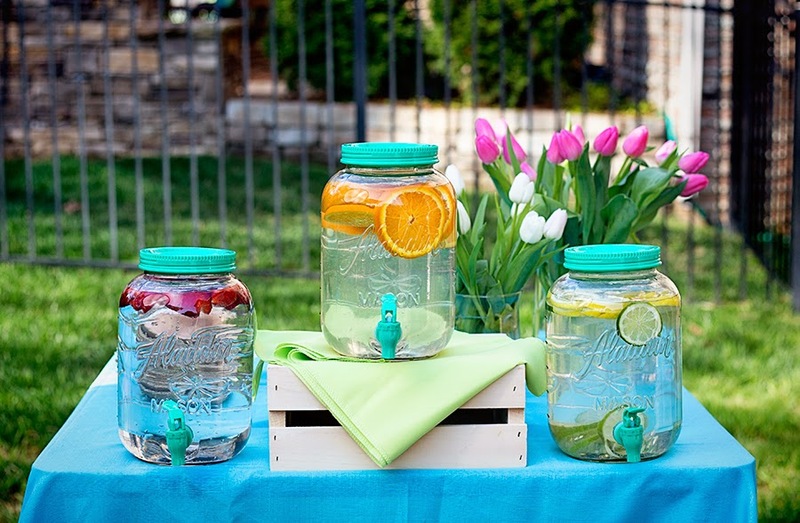 I chose lemon/lime, orange and strawberry infused waters and they were a big hit. 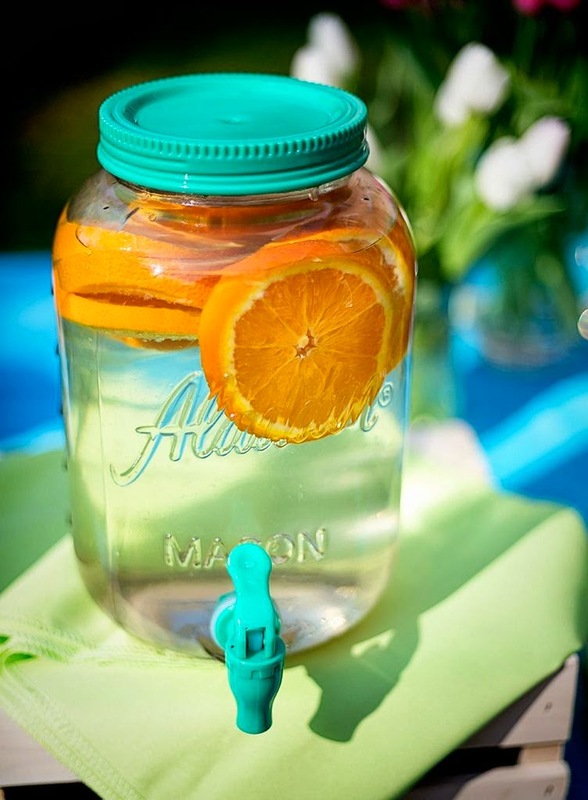 I love the way this big orange slices look in the water, don't you? That is my simple menu - a few pretty brunch items and a couple of drink options, that's it! 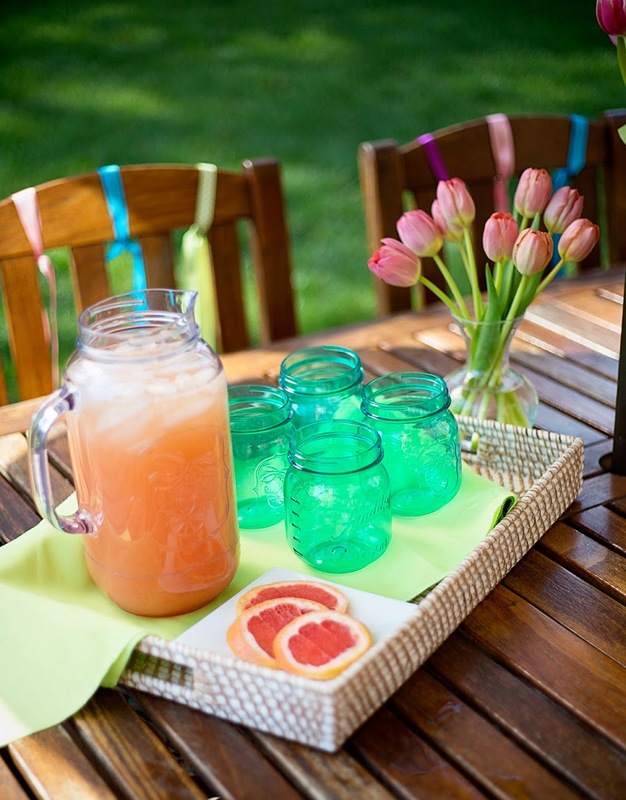 Throw a couple of tulips in the background and of course serve your drinks in Aladdin Mason Jars and you've got yourself a banging par-tay. 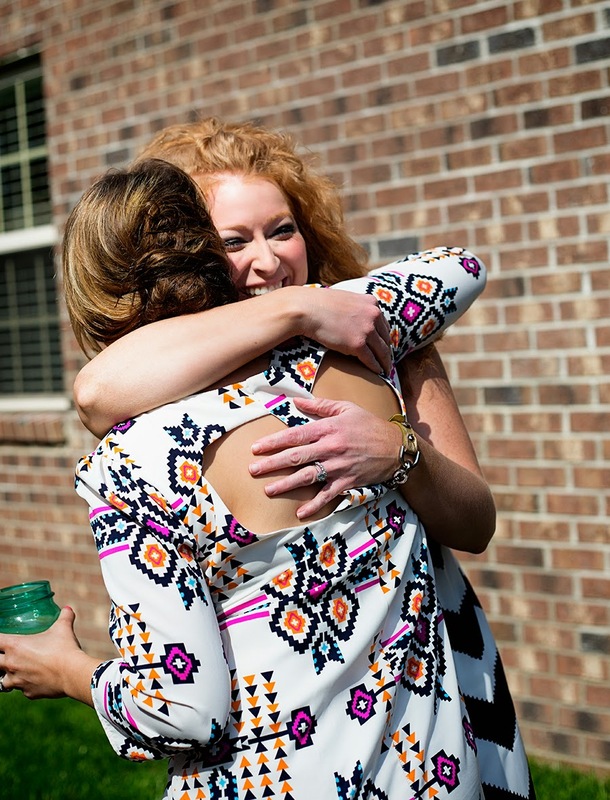 Here are a few more beautiful photos from the day. Aladdin generously provided goodie bags for each of the guests to take home some Aladdin swag. 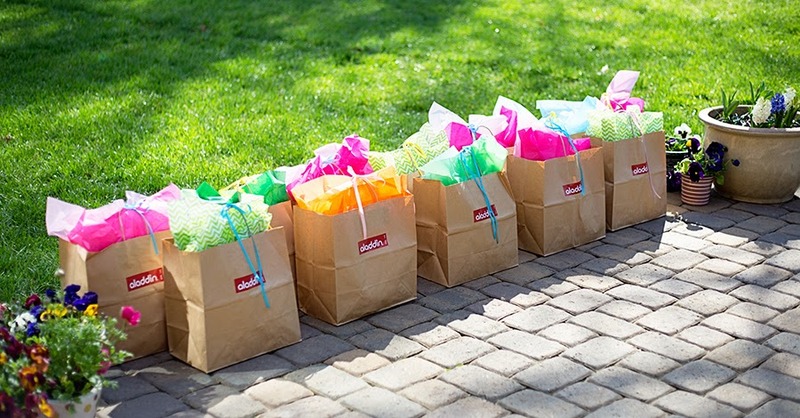 I dressed up the bags with ribbon and colorful tissue paper. 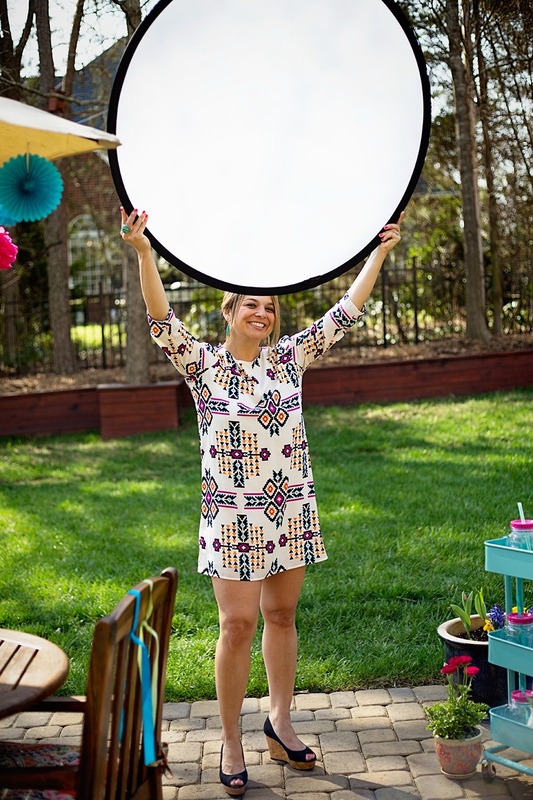 Here's what happens behind the scenes at a photo-shoot - someone (aka me) has to hold up the fancy diffuser to block the sun. And also friends being beautiful - isn't my friend Amanda gorge? She has the best hair. And she's super buff because she does crossfit - she could totally benchpress me. Speaking of beautiful, can we talk about this? 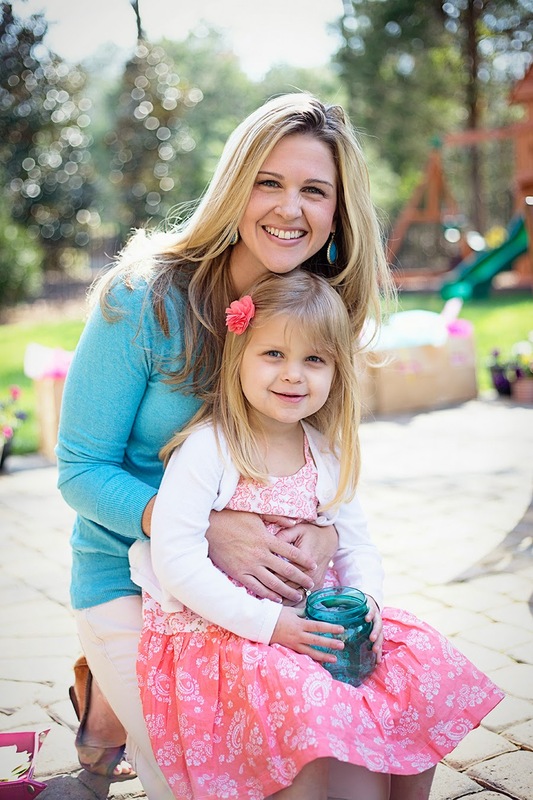 My beautiful sis-in-law Drew (owner of the gorgeous yard we were in) and her daughter (my niece) Brooke? They're like model mom and daughter, am I right? You guys. This was SO MUCH FUN to throw this party. Thanks again to my talented friend Kristen LeQuire for her gorgeous photos. I'm obsessed with it and want to do it every weekend. If you're bored this weekend just throw a party. It will be fun, I promise. Have a GREAT weekend and enjoy the spring weather if you are lucky enough to get any! XOXO. 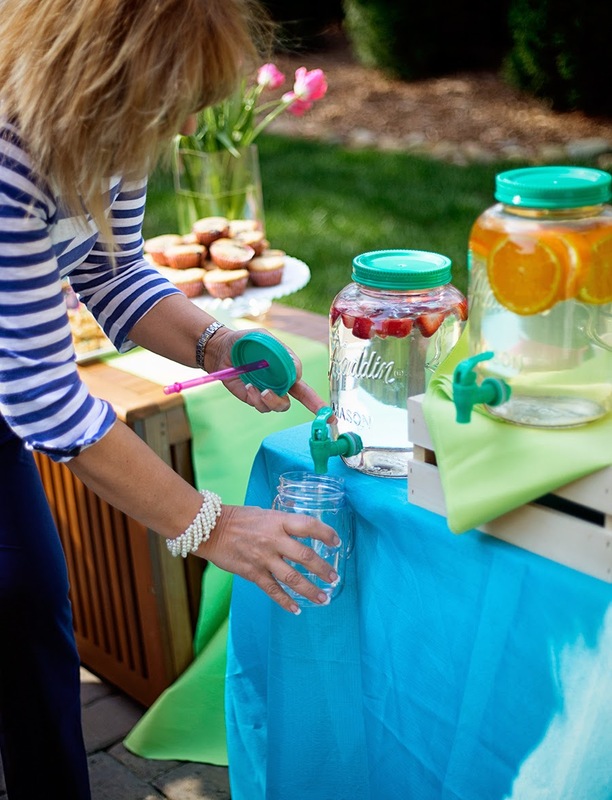 Disclaimer: I have partnered with Aladdin via MomTrends for this party and blog post. They provided me with the Aladdin products as well as compensation. The opinions expressed in this post are my own.